The summit was headline news across North Korean state media outlets on Monday morning, or more accurately it was Kim Jong Un’s departure from Pyongyang, his arrival in Singapore and his meeting with the Singaporean PM that was the focus of the stories. Despite little coverage until now, the stories all noted that Kim would be meeting with President Trump and discussions would include issues such as a new relationship and peace and stability on the Korean peninsula. 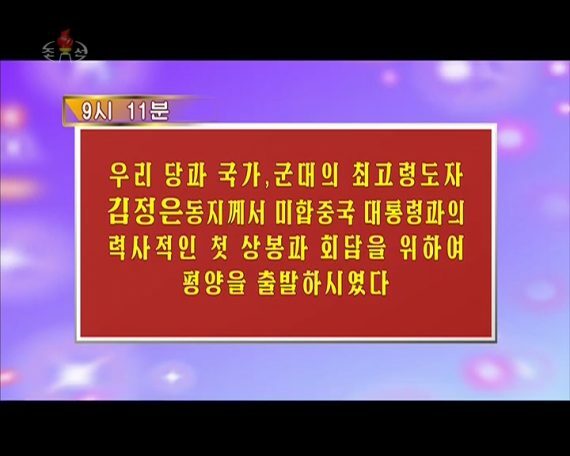 The Rodong Sinmun led with two pages of images of Kim’s departure, arrival and meeting with the PM and just after state TV came on the air at 9am, three short bulletins were broadcast covering each of those subjects. Two were anchored by Ri Chun Hee and all three included the still images. No video of Kim was broadcast. As we’ve seen in other major events this year, that usually waits until the entire event is over and a longer propaganda documentary is edited. The news bulletins were broadcast six times during Monday: at 0911, 1200, 1500, 1800, 2000 and 2227. This kind of repetition is common on North Korean TV for events involving Kim Jong Un and typically includes repeats on two or three subsequent days. 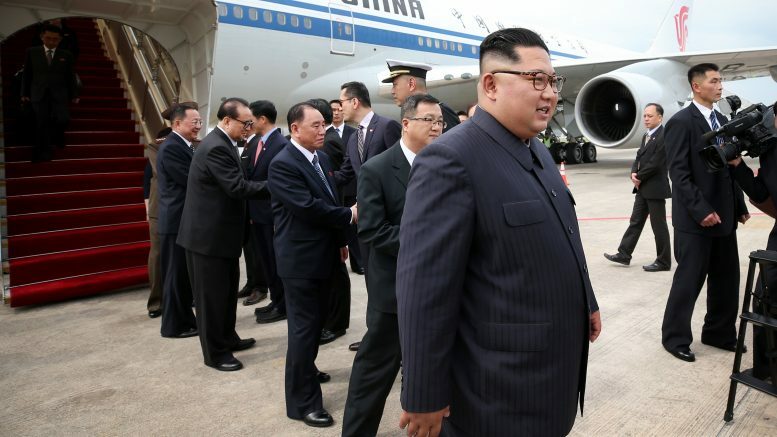 Kim apparently spent most of Monday inside his hotel, with the exception of a late-night visit to Marina Bay Sands, so it will be interesting to see if state media has much new material to run with tomorrow. The timing of his excursion today would require an unusually fast turnaround for state media if it’s to lead bulletins tomorrow morning. There was a single curiosity in today’s reporting. Take a look at the video below and you’ll notice that the still images of Kim were only broadcast in the first two runnings of the news that day. For some reason, subsequent airings neglected to use them. 1 Comment on "How North Korean TV covered the summit – Monday"